Such things as the palace facade and royal icons like the bull's tail would seem to have been adopted from Sumer or its environs. Less visible are the fundation deposits which are common to both civilisations. Centuries latter, the Hittites did not have them, despite the early presence of babylionians in Anatolia. See my post above, Dadude. The dating in that Discovery Channel web page is somewhat off. The tomb to which it refers, Tomb U-j, dates to Naqada III, so the inscribed bone labels would not be older than about 3,200 BCE. Sumerian cuneiform remains the older of the two scripts, but barely. And as I emphasized before, evidence may yet be found to reverse that. Well, basically, the "racial picture" of egypt in the early parts of her history is pretty uniform cross the board, with both lower and upper egypt having pretty much the same populations, which really aint surprising since they spoke the same language and (by unification) shared the same culture. It would've been more complex than that. We know there was extensive interaction between prehistoric Lower Nubians and Upper Egyptians, specifically between the Qustul culture and the people of Hierakonpolis. Even before state formation there were Nubian-style burials well inside the Nile Valley of Egypt. Similarly plentiful pottery excavated in Lower Egypt and in the Delta show that there was a lot of trade and interaction between the people there and in the southern Levant. All of this demonstrates a significant mixing of peoples even from the very beginning and reflects the ethnic makeup of Egypt throughout the dynastic period. These tablets were an earlier pictographic form of the "wedge-writing" with which most people are familiar when they think of cuneiform, and resembled this beautiful tablet from the collection of the Oriental Institute. The first pictograms from the Uruk period were a complete representation of animals, fishes, plants, just like the hieroglyphs. What is on your link looks to me as an 'intermediate step' (Forme linéaire - période Dyn. ancien). It seems that I have only one book which mention this topic : Henry Saggs Au Temps de Babylone (1995/2008). Several sites explain the foundation deposits if you do not have the proper books. In fact, if my memory serves my right, the nubian kingdom of qustul seems to have conquered much of upper egypt and were driven out before Dynasty I. My understanding is just the opposite. My main source for this information is, by the way, Toby Wilkinson, one of the leading scholars in the earliest stages of Egypt. Awhile back I read his book Early Dynastic Egypt, and I must say it was one of the most informative and interesting reading experiences I've had in quite some time. He is also the author of Genesis of the Pharaohs. In any case, Wilkinson explains how by the start of state formation, Upper Egyptians were ruthlessly assaulting the A Group people of Qustul. The most likely reason was that the emerging nation-state rulers from Hierakonpolis and This wanted total control over the lucrative trade corridors controlled by the Qustul rulers, rather than maintaining the status quo and allowing Qustul to go on as the middle men. The unfortunate thing is that the Qustul culture was on par with Upper Egypt in the process of state formation, but the conquests of the late Naqada III rulers and Dynasty 1 kings ended that. The conquests went on into the Old Kingdom, and evidently by the time of Sneferu, the A Group of Lower Nubia was wiped out. I'm not familiar with the work of Gunter Dreyer. Most of the scholars to whom I turn for information (e.g., Toby Wilkinson, Aidan Dodson) date the Naqada III period (Dynasty 0) to about between 3,150 and 3,000 BCE. I do not usually see historians place Naqada III prior to 3,200 BCE. I definitely agree that the figures "3,150 and 3,000" are not written in stone, as it were , and there may be a flux of 50 years or so, but putting Tomb U-j much before that would place it in Naqada II, and I don't know of scholars who are expert in this time period who try to place the tomb quite that far back. Still, the interval between the rise of writing in Sumer and in Egypt is so very slight (as the evidence stands now), so there is room for some argument. However, I think both you and I agree that in no way is Egyptian writing a copy or adaption of cuneiform; the two languages are strikingly different. 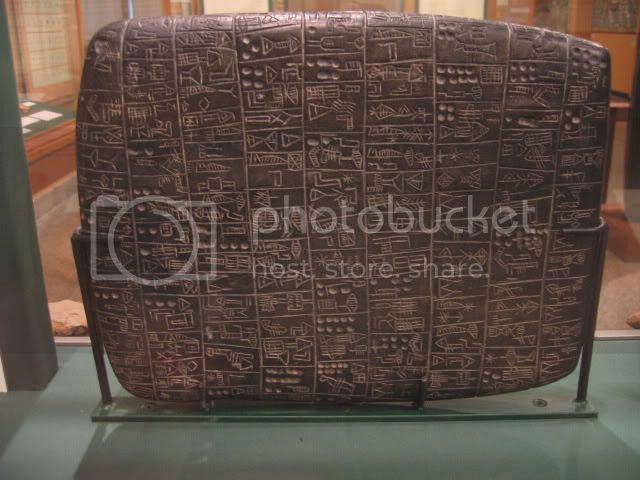 But I do believe in the possibility that the Egyptians may have been inspired by cuneiform to create their own script. Well yeah of course the egyptians took over, and wiped out, the kingdom of Qustul (in lower nubia) by Dynasty I, in order to control trade routes and wat not, but you still aint get what Im talking about. bruce willaims in his report on Qustul talks about how a bowl from the grave site shows how nubia conquered, or attempted to conquer, upper egypt (it shows a vulture tearing at a proto-hieroglyphic sign for upper egypt, ta-shemau or somn like that), and that probably explains the presence of A-Group graves in hierkanapolis and other sites. same page in saying that hieroglyphs is related to cuneiform in terms of one influencing, or being adapted to, the other. the languages the two scripts are written in are not even distantly related, no one's found two signs in common, and yeah . For those who know to-day world it is doubtfull that people along the Nil had the same culture before unification. After unification, people carries their local language, and the culture which goes with it, for ages. The various theologies (Heliopolis, Memphis, Hermopolis, Thèbes) are proof of different cultures. The Goddess Hathor, mistress of Byblos and Punt was there from early time and is evidence of a strong foreign presence if not origin. Her cow caracteristic could be an indication she was from from sumer. Moderar's Note: Dadude keep your responses civil. I will delete comments that are inappropriate. Anneke, I have no idea what this person means. His others expressions make me believe it is not necessary to know. Back to Hathor, kmt_sesh mentionned a top book from T.Wilkinson. From page 283 : Hathor's name proclaimed motherhood as her principal function, so it is not surprising that the Egyptians portrayed her as a cow : there are parallels in other African, particularly Hamitic, cultures in which the cow is a powerful mother-image. Wilkinson and probably Frankfort (who is mentionned as a ref.) forgot that the kings of Sumer were the sons of a cow. Horus being the word for king in early dynastic Egypt, IMO we have here a parallel. Herodote start his first book saying : According to the Persians best informed in history, the Phoenicians began the quarrel. This people, who had formerly dwelt on the shores of the Erythraean Sea. Very Early, Egypt had relation with Byblos which was latter a Phoenician port. Hathor was mistress of Byblos and Punt. Wherever is Punt located, it is on the Erythraean Sea shores. Recently on EEF, we were remained that tA-nTr (God's Land) was in Egyptian texts mentioned with Punt and Retenu [Byblos area]. - Before the kings, Egypt was ruled by the Gods who latter retired. - In Ancient Iran (and China) Red is the colour of the South and Black the colour of the North. (Black sea - Red sea). - In Deir El Bahari temple, Puntites and Egyptians look nearly alike. - Relation between the words Punt and Punic (Phoenician - Carthage), if any. To influence Egyptians it does not take a lot of people, therefore what human archeology tell us cannot be conclusive.